KANSAS CITY, Kan. — One of the provisions in the “Charter for the Protection of Children and Young People” signed by U. S. bishops in 2002 is that dioceses undergo yearly safe environment audits. These audits have been conducted by StoneBridge Business Partners, a private firm commissioned by the U.S. Conference of Catholic Bishops. 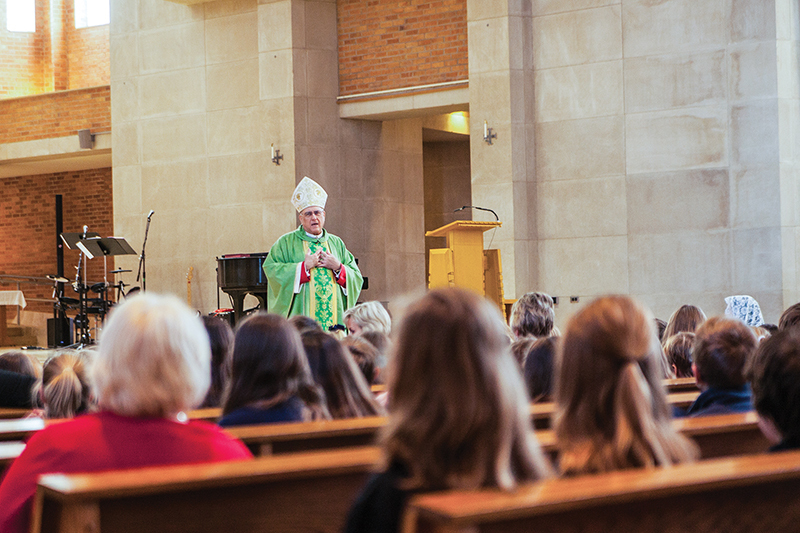 Early in November, Archbishop Joseph F. Naumann received a letter from StoneBridge. The company’s findings? The Archdiocese of Kansas City in Kansas was in compliance with the charter for 2018. This came as no surprise to Father John Riley, director of the archdiocesan office of child and youth protection since 2009. “We have consistently been found in compliance with provisions of the charter since 2003, and we are pleased once again, to state that we’ve been found in compliance in our most recent on-site audit, which concluded in October,” he said. The annual audits are scheduled on a three-year cycle, he said. StoneBridge does a records and procedures audit for two years and, every third year, the firm sends auditors to archdiocesan schools and parishes to do on-site audits. On-site audits consist of interviews, examination of records and inspection of the selected sites. StoneBridge — not the archdiocese — selects who will be audited. “The auditors . . . interview the archbishop and those in leadership positions, and those responsible for implementation of the safe environment program,” said Rita Herken, archdiocesan director of administrative services. This year on-site audits were conducted at Maur Hill-Mount Academy in Atchison, St. Benedict Parish and School in Atchison, Immaculate Conception Parish in Valley Falls, and Sacred Heart-St. Casimir Parish in Leavenworth. Beyond the StoneBridge audits, the archdiocese has implemented additional scrutiny. Maur Hill-Mount Academy has had two on-site safe environment audits since he became president and headmaster, said Phil Baniewicz, who has led the school for nine years. One thing the auditors check is that everyone has taken their Virtus child protection training and kept current on it through the monthly training bulletins. The auditors also check to see if all students have received child protection training, and if the blue cards, which contain contact information to report suspected abuse and neglect, are posted in prominent areas. The work of maintaining safe environments never ends, and the audit is one of the essential tools in this ongoing effort.